Heat oven to 400°F. Unroll dough on work surface. Roll dough into 13x10-inch rectangle. With 4- or 5-inch pumpkin-shaped cookie cutter, cut dough into 6 pumpkin shapes, rerolling dough if necessary. Place 1 inch apart on ungreased cookie sheet. Spread pizza sauce over shapes to within 1/4 inch of edges. Sprinkle with cheese. Cut 6 slices of the pepperoni into triangles; place on pumpkins to create eyes. 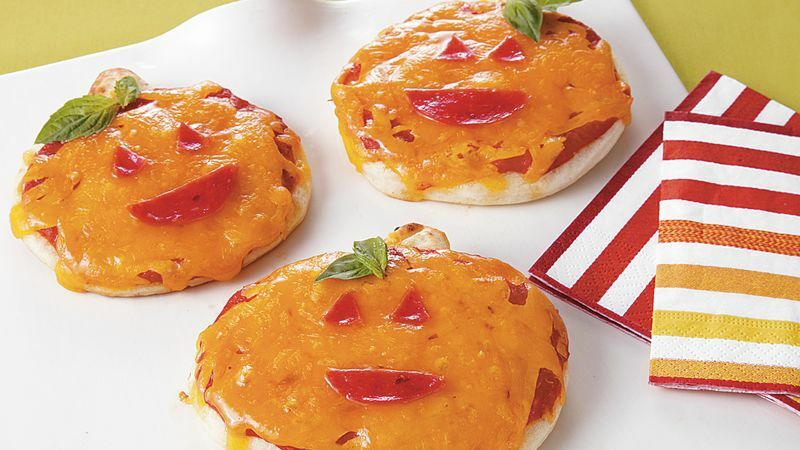 Cut remaining 3 pepperoni slices in half to look like jack-o’-lantern mouths; place on pumpkins. Place 2 basil leaves on each for stem. Bake 10 minutes or until cheese is melted. Use your favorite cookie cutters and let the kids help cut out dough shapes.